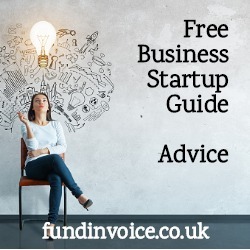 FundInvoice are able to help you find a range of different business finance services from business loans, to receivables financing, export finance and trade (or import) finance. Please call Sean on 03330 113622 or request a call back from FundInvoice. See the Government website for further help for new startups and for help writing a business plan. Our colleagues at Tecwork can help you with any IT systems requirements (e.g. computers, Macs, PCs, servers etc. ), from 2 users upwards, if you are based in Sussex, Kent or London. In Association are a full service marketing agency that can help with everything from branding and design through to marketing planning, advertising and PR. Contact In Association for a free initial consultation. Again, for help with telecoms related issue e.g. phones, phone systems and business mobiles, contact Tecwork who will assist you if you are based in Sussex, Kent or London.